Cato Manor Development Project: World-wide acclaim. The Cato Manor project has achieved world-wide acclaim from development specialists as a model for integrated development. It is the largest inner-city urban development project in post-apartheid South Africa. Much of it's success is attributed to a higher level of grassroots community involvement. The project consists of the construction of low-cost housing, schools, libraries, community halls, roads, clinics, In addition, the CMDA (Cato Manor Development Association) focuses on the stimulation of economic development and community empowerment through interventions such as training schemes and small, micro and medium enterprise development. 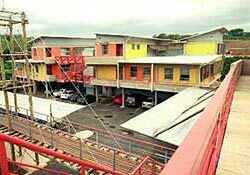 Cato Manor is situated within the boundaries of the Durban Metropolitan area, and is home to about 93000 people with a future population estimated to be 170 000. It was an area that suffered greatly under the Apartheid government's policy of forced removal of squatters. The development incorporates the need to redress these injustices and promote black empowerment. The CMDA is the agency responsible for redevelopment and has secured substantial funding from the European Union, local, provincial and central government as well as other funding agencies. To date, R380 million in public sector funding has been invested in the project. the latest issue of CMDA's online newspaper IZWI.